But some analysts say that the issue of Hindu nationalism is central to the party’s identity and election strategy, try as Mr. Modi might to distance himself and project economic development as his main plank. Now that the election has entered its home stretch, with just three more polling phases to go, those analysts say that the party has some strategic interest seeking to secure as many votes as possible, by any means. Uttar Pradesh and Bihar, two states that control more than one-fifth of the seats in parliament, go to the polls in six phases each — and each has three more phases to go. As two of the electoral powerhouses of the country, they provide a strong indication of the Bharatiya Janata Party’s ability to win votes at the national level. Traditionally, the Bharatiya Janata Party has had difficulty overcoming strong caste identity politics that have fragmented the Hindu vote, but analysts say they are hoping to promote a pan-Hindu identity to capture large portions of these two states. In Uttar Pradesh, Mr. Modi’s close aide, Amit Shah, gave a speech to Hindu Jat farmers in which he urged them to vote to “take revenge” for bloody riots in September that killed at least 60, both Jats and Muslims, and displaced more than 50,000 Muslims. Mr. Modi did not distance himself from Mr. Shah’s comments. Some have said that the statements of the past week by politicians with a much lower profile than Mr. Shah were merely cases of minor politicians voicing their personal views, not to be taken as representative of the party. But others point out that Rashtriya Swayamsevak Sangh, a right-wing Hindu organization associated with the B.J.P., has helped organize the campaign. “Their aim is that the primary identity of an average voter in this part of the country is being Hindu, not being the particular caste that he belongs to,” said Varghese K. George, the political editor of The Hindu, a national daily. 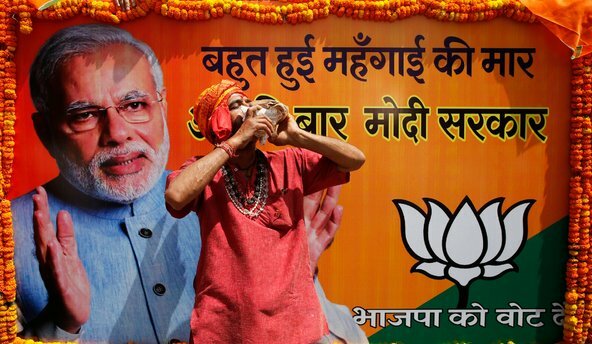 Mr. Modi has regularly tried to dispel this idea in speeches on the campaign trail. Part of the the reason why Mr. Modi is unable to dispel a reputation for divisive politics is that he presided over Gujarat as its chief minister when the state saw some of the worst Hindu-Muslim violence in the country, over three days in 2002, which left 1,000 people, mostly Muslims, dead. Another is that, although he has largely projected a gentler image in recent months, he has not been above divisive rhetoric himself on the campaign trail, especially in locations where religious tensions run high. Published on April 25, 2014 in The New York Times India Ink.